Kilmainham Jail It's Heros And Songs. A short history of the songs that emerged from Kilmainham and the ballad singers who contributed their songs in the restoration of the prison. 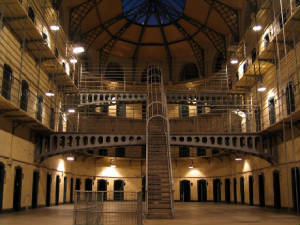 The restoration of Kilmainham Jail would most likely not have taken place without the generous support of some of Ireland's finest folk singers who contributed their time and music for free in the production of the album ''Kilmainham Jail It's Heros And Songs'' , The singers and bands who made up this album were The Furey Brothers And Davie Arthur with their compisition of Banshee, The Dublin City Ramblers preformed Boolavogue and the Ballad Of Robert Emmet along with The Bold Fenian Men.Mary Black sang Pete St. John's song Anne Devlin, Only Our Rivers Run Free along with Avondale. Paddy Reilly gave his rendition of The Foggy Dew along with the rebel song James Connolly.The Wolfe Tones contributed Come Out Ye Black And Tans,All Around Me Hat and A Nation Once Again.The album was released by Dolphen Discs who at the time were one of the only record companys promoting folk music in Ireland. The Irish consider Kilmainham Jail not mearly as a museum but as a national shrine. Here in Kilmainham Goal since 1787 were kept generations of Ireland's polictal prisoners.The patriots who's names are in the hearts and minds of all true Irishmen. More recent history saw as it's occupants those involved in the last Irish rebellion in 1916. All of the leaders of 1916 were executed in Kilmainham. Here too one of Ireland's presidents Eamon De Valera was interned and finally released in 1924 when the jail closed down. the prisoners cells at the jail, they are shown the induction room and the corridors through which the patriots walked on their last journey. On view there's highly impressive collection of valuable papers, weapons and photographs which document a major part of Ireland's history in her fight for freedom.It's here that Joseph Mary Plunket married Grace Gifford on the day before he was to be exicuted.Anne Devlin [1778-1851] spent three years in Kilmainham prison in solitary confinement just for knowing Robert Emmett, another 20 members of her family also served time here. This is also the prison where my own grandfater was imprisoned in for doing his part in the fight for Irish freedom. civil war some 77 men were exicuted by The Free State Army. with intro. by Ronnie Drew.